It's a difficult transition going from structured, goal-oriented training to an unstructured off-season period, but it is starting to be enjoyable. I find it hard to take a complete break from running, so I am still mixing 3-4 runs a week in, but the running has been the unstructured, leave your watch at home variety. I am also trying to gain some strength and flexibility, mixing in some new workouts and trying to have fun, while giving my joints, muscles, and tendons a time to rest before the hard training starts again. 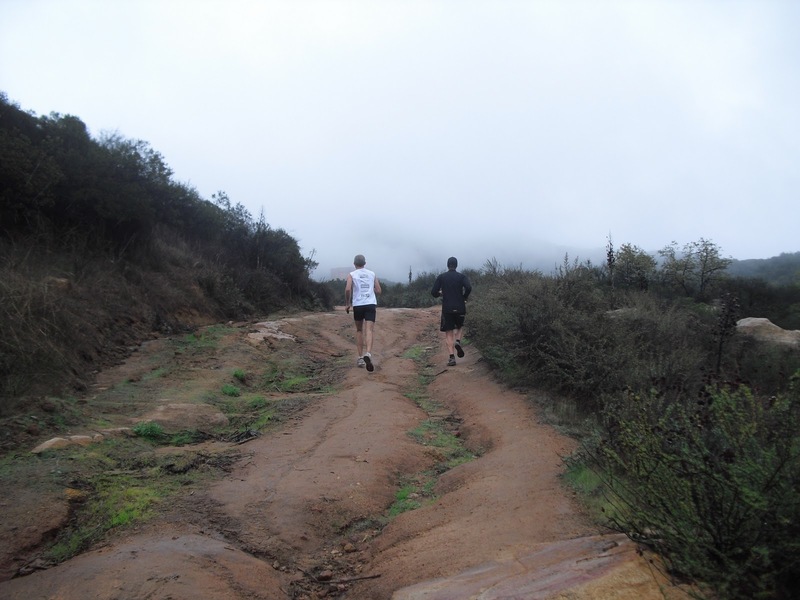 Last weekend I did a 10 miler out in Daley Ranch organized by Movin' Shoes' Mick Gieskes (who is also a track and field coach at UCSD). Mick gave us some great running tips and something to focus on as we ran the hills. He reminded me to watch my stride on the downhill and to keep it compact, as most people tend to over-stride when running downhill. He also talked about focusing on the foot strike as your foot touches the ground, keep it engaged, flexed and active, limiting the time your foot is in contact with the ground. The route became really muddy in parts and it was a struggle keeping my balance. It was a difficult run as the rain and wind really started to pick up, soaking through my clothes and numbing my fingers, but those tough runs are always the ones I remember. Thanksgiving morning I joined about 30 others from a local running group and we ran up and down Iron Mountain. The climb to the top started gradually and increased in difficulty as the summit came into view. The view from the top was an amazing and clear panorama of most of San Diego County. The descent was a lot of fun. Since I don't have any major races coming up, I was able to risk a twisted ankle, bounding down the hill and pushing the limit between adrenaline rush and bloody knees and scraped palms. The day after Thanksgiving I joined about 15 other friends for Turkey Bowl 2010, a chance to use muscles I haven't used since Turkey Bowl 2009. We have been getting together for nearly 20 years for our annual football game, and we are all a little older, slower and more concerned about health insurance than we were 20 years ago. Luckily, I survived the day and the only injury was to my ego. We hit Pizza Port after the game and discussed glory days, come from behind victories, and diving catches over seven large pizzas and seven pitchers. Saturday was my oldest daughter's birthday, which we held at the local climbing gym, so I went an hour early to set up and get a few climbs in. It was great watching a bunch of 9 year old kids scaling the rocks, reaching the top and beaming with accomplishment. I'm hoping that a couple of weekly mountain bike rides, some core workouts, family hikes and 3-4 weekly trail runs will keep me in shape and help balance out the holiday eating binges, while mixing it up and giving me a break from serious training.